1. To determine the overall heat transfer coefficient at the surface of a given vertical metal cylinder by the natural convection method. 2. To determine the value of Nusselt number. 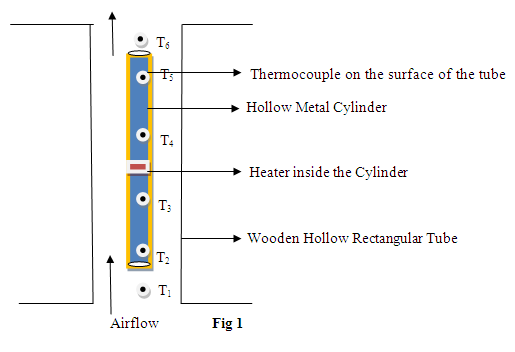 Natural Convection Apparatus - a metal cylinder fitted vertically in a wooden rectangular duct which is open at the top and the bottom (Fig 1). An electric heater is provided in the vertical cylinder, which heats the surface of the cylinder. Heat is lost from the cylinder to the surrounding air by natural convection, because the air in contact with the cylinder gets heated and becomes less dense, causing it to rise. This in turn creates a continuous flow of air upward in the duct. The temperature at the various locations on the surface of the vertical cylinder and in the incoming and outgoing air is monitored with thermocouples. The duct is made of wood because it is a poor conductor, so not much heat will transfer from the air to the duct. Thus the duct will enhance air flow without introducing another convective surface. Heat transfer theory seeks to predict the energy transfer that takes place between material bodies as a result of temperature difference. This energy transfer is defined as heat. The three modes by which heat can be transferred from one place to another are conduction, convection and radiation. It is well known that a hot plate of metal will cool faster when placed in front of a fan than when placed in still air. With the fan, we say that the heat is convected away, and we call the process convection heat transfer. Convection involves the transfer of heat by motion and mixing of a fluid. Forced convection happens when the fluid is kept in motion by an external means, such as a turbine or a fan. Some examples of forced convection are stirring a mixture of ice and water, blowing on the surface of coffee in a cup, orienting a car radiator to face airflow, etc. Convection is called natural convection when motion and mixing of fluid is caused by density variation resulting from temperature differences within the fluid. The density of fluid near the hot surface is less than that of the colder fluid away from the heated surface, and gravity creates a buoyant force which lifts the heated fluid upward. Where ∆T is the temperature difference across the thickness L, and k is the thermal conductivity of the object. Where h is the convective heat transfer coefficient (units Wm-2 K-1) which depends on the shape and orientation of the object. ∆T is the temperature difference between the surface of the object and the surrounding fluid. Where k is thermal conductivity of air and L is the characteristic length. Note that N is a dimensionless quantity. In our case, which does involve turbulent flow, we are interested in temperature variation along the length of a metal cylinder, so we will take the characteristic length L to be the length of the cylinder. 1. Cooling of commercial high voltage electrical power transformers. 2. Heating of houses by electrical baseboard heaters. 3. Heat loss from steam pipe lines in power plants and heat gain in refrigerant pipe lines in air conditioning applications. 4. Cooling of reactor cores in nuclear power plants, though often the coolant is driven by pumps, resulting in more efficient heat transfer by forced convection. 5. Cooling of electronic devices (chips, transistors) by finned heat sinks, though a fan is often present to augment the natural convection with forced convection.